Hyderabad, August 22: Amandeep Drall kept her foot on the pedal and did not let go of the form she has been in over the last few weeks. 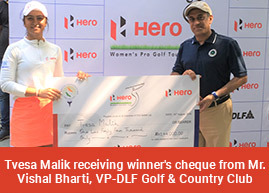 Amandeep, who has won three times in the last four starts, opened the 12th leg of the Hero Women’s Pro Golf Tour with a solid even 71 with two birdies and two bogeys. That score gave her a handy three-shot lead. Tvesa Malilk and Sonam Chugh were tied second at 74, while Millie Saroha and Suchitra Ramesh both shot 76. Amateur Sneha Singh was Tied-6th with Siddhi Kapoor and Khushi Khanijau, who had a good outing last week in the 11th Leg. They shot 77 each. Amandeep, who did not win even once in the first seven legs, has won the eighth, 10th and 11th leg and set herself up nicely for the current one too. She opened the day with a bogey and then ran a string of pars all the way till seventh, which she birdied. She dropped another shot on the Par-4 ninth and then parred the next seven holes till she again birdied the Par-4 17th. Tvesa Malik seemed to have problems on the greens. She dropped four bogeys against no birdies till she found her only birdie of the day on the 18th for a card of 74. Sonam Chugh had two birdies on the 14th and 17th, but also dropped three bogeys in a space of five holes from the seventh to the 11th with a double on the Par-4 15th. Due to prior incessant rains which eased only yesterday, the course was challenging today, with strong winds making the conditions more difficult. With not too many birdies recorded, the players will be hoping for more favourable conditions tomorrow. Afshan Fatima and Ayesha Kapur will go out first on Thursday, while Siddhi Kapoor and Khushi Khanijau will follow them. The third group has amateur Sneha Singh, Suchitra Ramesh and Millie Saroha, while the lead group with Sonam Chugh, Tvesa Malik and Amandeep Drall will tee off last.